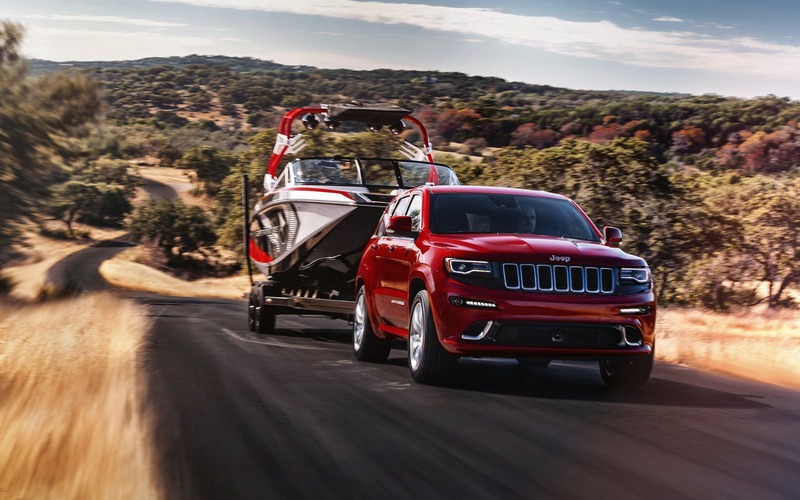 When you look at the 2016 Jeep Grand Cherokee SRT, it would be easy to think that the souped-up SUV hasn't received any significant changes since last year. The instrument panel is different. Though pictures have yet to be released, the manufacturer has said that there is now a 7-inch screen, and the rev counter has been moved to the centre of the cluster, right in front of the driver's eyes. There are now no less than eight different drive modes, each of which can modify throttle response, transmission shift points, stability control settings and suspension firmness. Modes include Custom, Auto, Sport, Track, Snow, Tow and Eco. There is now a Valet mode, which limits engine power, forces the stability control on and disables launch control. The engine underneath the Grand Cherokee SRT's hood is still the 6.4 litre HEMI with its 475 horsepower and 470 pound-feet of torque. Thanks to that engine, the big truck gets from 0 to 100 km/h in 4.8 seconds. If we listen to the rumours, we hear that Dodge's Hellcat engine could eventually find its way in the Grand Cherokee SRT, creating a new Trackhawk variant. For now though, these are just rumours. News A Jeep Grand Cherokee Hellcat In The Works?